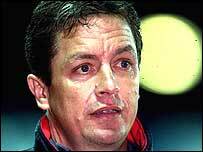 League One side Northampton Town have named Stuart Gray as their new manager to succeed John Gorman. Gorman resigned as boss last week and the Cobblers have moved quickly to appoint ex-Southampton manager Gray. Gray told the club's website: "I am very pleased and proud to be given this chance. The club has a good feel to it and I've seen how ambitious they are." Gray will be officially presented to the media at a Northampton Town news conference on Wednesday. Gray added: "I was at the Millwall game on Saturday and saw how well they played. "I know we are at the wrong end of the table but if the players keep showing that kind of effort and commitment we won't go far wrong. "I will quickly be evaluating what we have and the areas that need strengthening and getting down to work right away." Northampton chairman David Cardoza revealed his delight at securing the services of the former Nottingham Forest and Aston Villa left-back. "Stuart is one of the most highly-respected and highly-rated young managers and coaches in the game," said Cardoza. "His CV is impressive, we spoke to him on Friday and he came across well. He will get the time and support he needs. "Despite only being young in management terms, he has a wealth of experience and contacts in the game. "We have sought the opinion of many people at all levels within the game. "They have all spoken very highly of Stuart and the professionalism that he brings with him. He has been very highly recommended to us by all of the opinions we sought. "We are very excited about this appointment and we are sure that the fans will join me in welcoming Stuart to Sixfields. "His appointment is a sign of our undiminishing ambition to make Northampton Town a Championship club and play in a re-developed Sixfields Stadium. "Stuart is young, highly intelligent man who has a real determination to succeed and we are very pleased to welcome him to the club."